Rustichella d’Abruzzo 100% organic Gluten Free line goes beyond the concept of “gluten free product”, as our long experience allowed us to create a product that preserves the undisputed excellence of quality of our traditional semolina dough and, therefore, turns out to be suited also for the non-coeliac consumers who would like to vary their diet without giving up on tastiness. 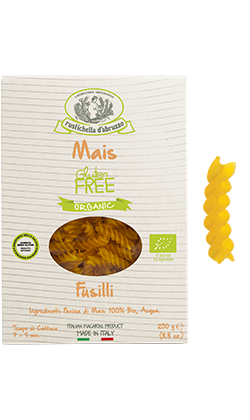 In fact, Rustichella d’Abruzzo is aware of the difficulty of making gluten free products as good in taste as foods containing gluten. 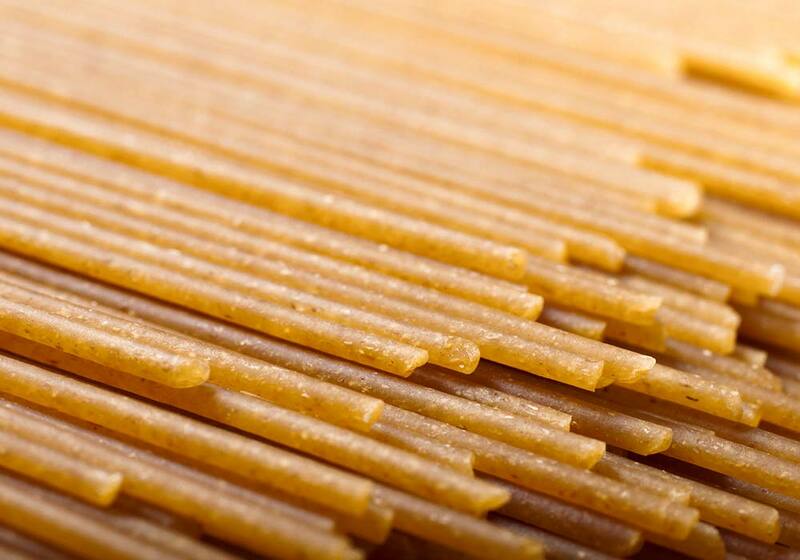 Our pasta is made exclusively with corn, rice, green pea and red lentil flour. It is 100% organic and rigorously certified by the controlling body CCPB, respecting our classic artisan production. Gluten is not an essential protein in our nutrition. Therefore, its removal does not imply nutritional imbalances. 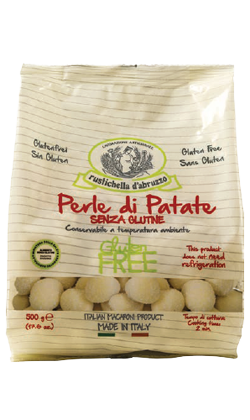 The best Chefs in the world use Rustichella d’Abruzzo gluten free line, which offers a wide range of references. The production process does not involve any risk of involuntary gluten contamination. 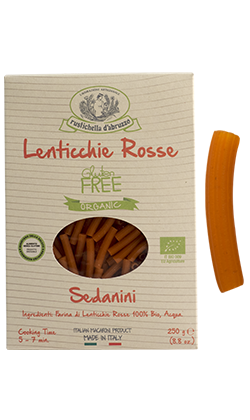 Rustichella d’Abruzzo proposes a totally organic and gluten free guaranteed new item, the Red Lentil Sedanini. A food speciality made only with 100% organic and OGM free red lentil flour, very well mixed with pure water of our mountains and dried at low temperature following our traditional artisan production process. It is naturally gluten free and perfect for the delicate nutrition of coeliac people, but also for the people who want to take care of themselves, without giving up on the tastiness of good cuisine. The Red Lentils are rich in plant-derived proteins and fibres and have also a low glycaemic index. 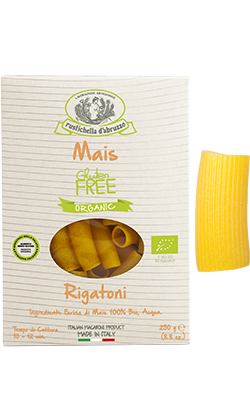 Ready in few minutes, it perfectly keeps “al dente” and is particularly suited for the preparation of vegetable-based recipes. Cooking time: 5-7 minutes. All the taste of corn contained in a speciality made exclusively with organic controlled and selected raw materials from Italy. Combination with Rustichella d’Abruzzo “vongole alla Marinara” or “Pesto al Pistacchio” is recommended. Cooking time: 7-9 minutes. All the taste of corn contained in a speciality made exclusively with organic controlled and selected raw materials from Italy. Combination with Rustichella d’Abruzzo “all’Ortolana” or “alla Norma” sauces is recommended. Cooking time: 7-9 minutes. All the taste of corn contained in a speciality made exclusively with organic controlled and selected raw materials from Italy. We recommend it with Rustichella d’Abruzzo seafood-based sauces, such as “alla Napoletana” or “alla Puttanesca”. Cooking time: 10-12 minutes. 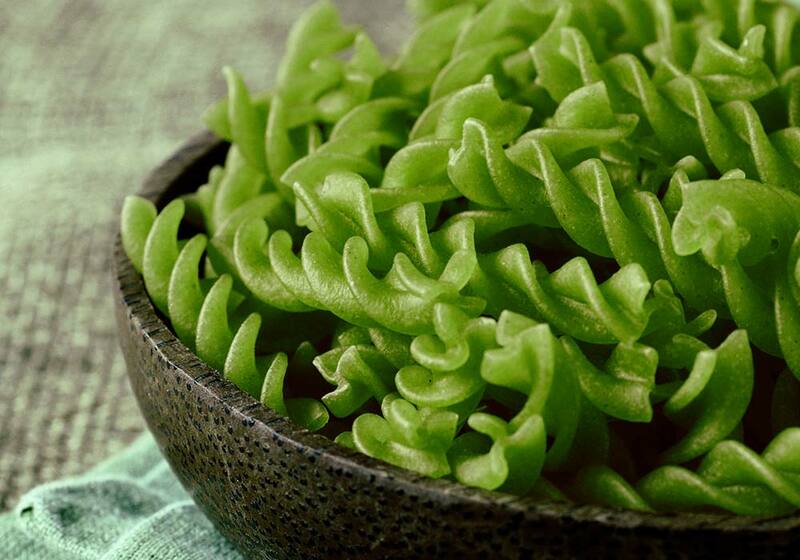 It is the most popular and most sold pasta in the world, the symbol of Italy abroad. Since it is very thin and long, this type looks like “piccoli spaghi” (small twines), hence its name “spaghetti”. It is present in all of the culinary traditions throughout all Italy, from the North to the South. Made with 100% organic whole wheat rice flour, pure water of our mountains, following our traditional artisan production process, it keeps all the organoleptic characteristics without altering the essential vitamins and amino acids for the organism. This type of pasta is extremely versatile and match most of the condiments. 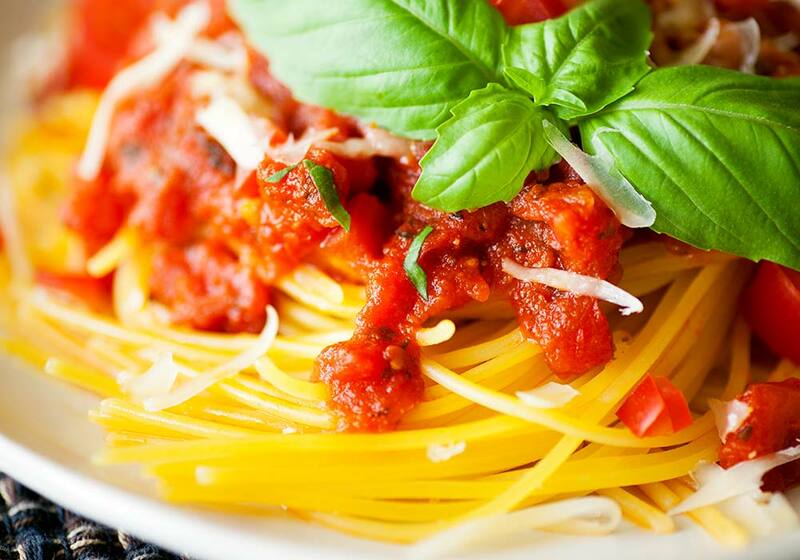 Everyone loves the classic combination with Rustichella d’Abruzzo fresh tomato and basil sauce. In order to appreciate the texture better, we recommend the simplest recipe, with Rustichella d’Abruzzo extra virgin olive oil and Farindola Pecorino cheese. Otherwise, vegetable-based condiments are a valid “healthy” first course. Cooking time: 8-10 minutes. 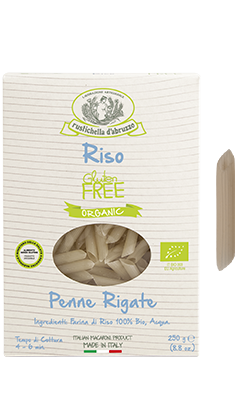 Penne rigate is a type of pasta very well appreciated throughout all Italy. Their main feature is the characteristic shape, which looks like a “pennino” (fountain pen). It is famous for being so versatile thanks to its “design”, which allows it to collect the condiments properly, and the deep grooves running on the outer surface, which allows the condiment to stick to the pasta. 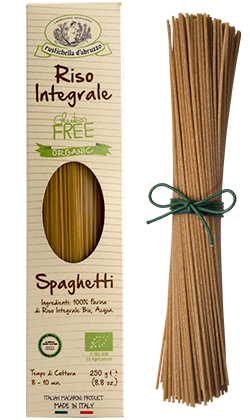 Made with only 100% organic whole wheat rice flour following the artisan slow drying process at low temperature, it preserves all the organoleptic characteristics and is perfect for main courses with meat-based sauces, or combined with vegetable-based condiments such as peppers, courgettes and artichokes. Try it with Rustichella d’Abruzzo “alla Arrabbiata” organic sauce. Cooking time: 7-9 minutes. 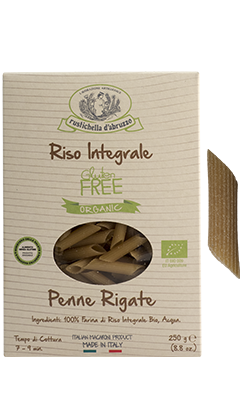 Made with only 100% organic rice flour, following the artisan slow drying process at low temperature, this type of pasta looks like a “pennino” (fountain pen), and its shape makes it versatile also for those who need to eat gluten free food. 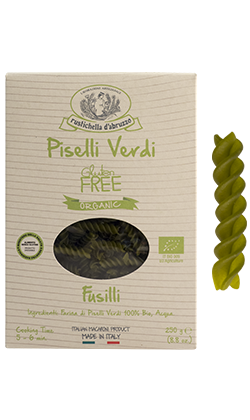 This pasta is perfect for main courses with vegetable-based sauces, or combined with fresh and light cherry tomatoes, capers Rustichella d’Abruzzo extra virgin olive oil. Try it with our organic Pesto alla Genovese, with a bit of minced toasted pine nuts and a bit of organic extra virgin olive oil and you will fall in love with it! Cooking time: 7-9 minutes. Despite what many people might think, buckwheat is not a cereal, rather a herbaceous annual plant, belonging to the family of Polygonaceae. 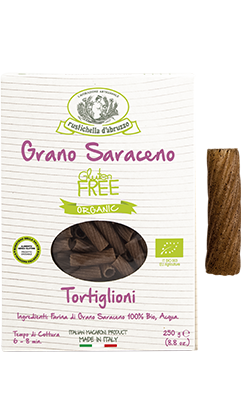 In Italian it is called grano saraceno (Saracen wheat): it is called like this because, according to the two current hypotheses, it was brought to Italy by the Saracens or because it reminds of the dark colour of the Saracens’ skin. The high biological value of its proteins, which contain proportionately the eight essential amino acids, allows it to stand apart from the common cereals. Furthermore, it has remineralising and energising properties. 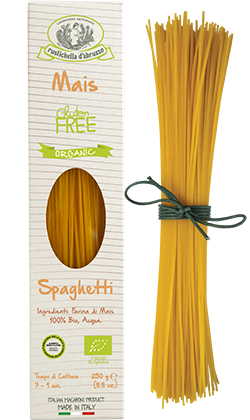 This pasta represents also a tasty alternative to a gourmet first course. We recommend it with Rustichella d’Abruzzo organic Pesto alla Genovese, a bit of Pecorino Romano cheese and 100% organic extra virgin olive oil. Cooking time: 6-8 minutes. Perle di patate (potato pearls) have an even softer and more substantial texture. We recommend it with two particular Rustichella d’Abruzzo condiments: organic Pesto alla Genovese for the lovers of “healthy” recipes and organic “alla Arrabbiata” sauce for the lovers of spicy flavours. Cooking time: 2 minutes. 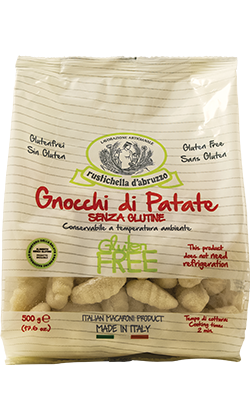 Gnocchi di patate (potato gnocchi) have an even softer and more substantial texture. The classic recipe is gnocchi “alla Sorrentina”, with smoked provola cheese and homemade tomato sauce. We also recommend it with two particular Rustichella d’Abruzzo condiments: chopped PrimoGrano Pomodoro a Pera with salty ricotta cheese, and white ragu “ai Funghi Porcini”. Cooking time: 2 minutes.